Nothing creates more impact than displaying a collection, particularly one of porcelain, en masse. 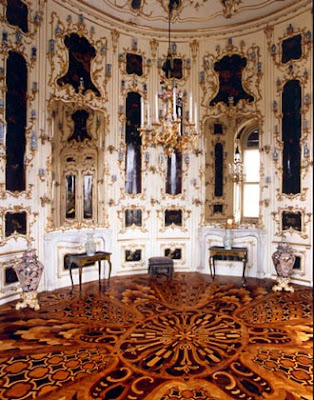 In the 18th c., some of the European palaces had porcelain cabinets and chambers- rooms in which the palace's collection of porcelain was displayed. 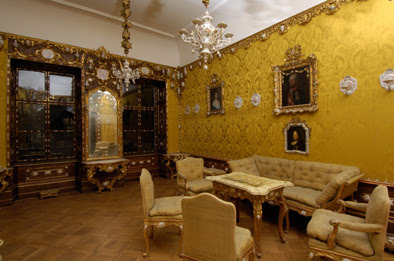 Many of these porcelain rooms were decorated with ornate gilt brackets on which the pieces of porcelain were placed. Of course, the grandeur of these rooms is not necessarily something to which the modern homeowner aspires. However, the grouping of brackets and objets certainly creates just as much visual impact today as it did centuries ago. Just look at the way this idea was applied in rooms designed by Jansen and Syrie Maugham. The moral of the story? Sometimes in design it's better to be bold, especially with collections. You can always show restraint in other areas! Porcelain Chamber from Dubsky Palace,Brno, now located in the MAK Museum, Vienna. Great post. I've been to Vienna, but somehow missed these palaces. Ah Jayne, nothing like casual life at the beach...so relaxing! Just kidding, what a great shot. Who took it do you know? Give her a Stark Louis Ghost chair and that inteior could have beeen done today. Mister- I know- is that shot not fabulous?? I'm not sure who took it, but I'll look in my Jansen book tonight and let you know. I love the Jansen photo - there's no better way to display those birds. The Wrightsman photograph is by Horst P. Horst. Thanks Anon! I should have known that. Isn't there also a similar display (not quite as grand) above Deeda Blair's desk? Not sure if I have the spelling of her name correct. I think it was published in HB just a few years ago, to show how timeless the design is? Courtney- How eery! I almost included that image, but didn't have it handy. Yes, it was a display above her desk of porcelain (or maybe tole) flowers in little rock crystal pots (I believe). I'm pretty sure Billy Baldwin designed the room. Thanks for mentioning this! The Maugham and Jansen displays are fantastic. I love how the design can allow a relatively small object to make a much bigger impact. Great photos. I love Jayne Wrightsman, but have found few photos of her or her homes. Thanks for sharing, I love the photo!! Ronda- There is one other photo of her (I think) and numerous photos of her homes in the Jansen book. I was fascinated when I saw the photographs of the Wrightsman Palm Beach living room when it had been decorated by Denning and Fourcade (after Jansen). Very over the top! Morrismore- I haven't seen those photographs! I'm sure it was quite over the top! I'll have to see if I can find these images. Those back to back sofas that Denning and Fourcade were so fond of...along with lots of pattern. I have the photos in one of my files. Once I find them, I'll send them to you. Remember, however, that the wonderful chinoiserie wallpaper in the Wrightsmans' house had been installed in the 1930s by its previous owners, Mona and Harrison Williams (she became Mona von Bismarck). It served as an amazing backdrop for Denning and Fourcade's extravagance. Meant to mention that the wallpaper had been installed in the Williamses' house by Syrie Maugham. Well, this makes me want to see the later images of the Wrightsman's home even more. Sounds beautiful. Isn't there a Beaton rendering of Mona and Harrison Williams in their Palm Beach living room?? Maybe one done for Vogue? The Wrightsmans' Palm Beach house was published in House & Garden, I believe, shortly before it was sold by the couple and demolished by a subsequent owner. (It was, I believe, a work by the architect Maurice Fatio.) Perhaps in the mid 1980s, I believe. And, yes, there is a Beaton rendering of the Williamses in that sitting room, done in the 1930s, likely for Vogue, depicting the Williamses posing on a long creamy white Syrie Maugham sofa with that green-blue chinoiserie garden scene wallpaper all around them. What a wonderful posting! Just some of the most charming rooms -- in any day or age! Many many thanks for the eye candy while I have lunch! The lovely Maugham dining room was decorated for her daughter and son-in-law, Liza and Lt. Col. Vincent Paravicini in London, in 1937, as their wedding gift. Maugham also decorated the rest of the house for the couple, who eventually were divorced in 1948. The figurines on the brackets appear to be circus figures or perhaps mounted soldiers of some kind, not nearly so lovely as the porcelain birds that Maugham used in other installations. Something to ponder: once you get the objects up on brackets, who dusts them? Good point. Although if you were to recreate the Maugham or the Jansen display, I don't think that would be too bad. Anything more elaborate (or higher up on the wall), well, I just don't know about that. 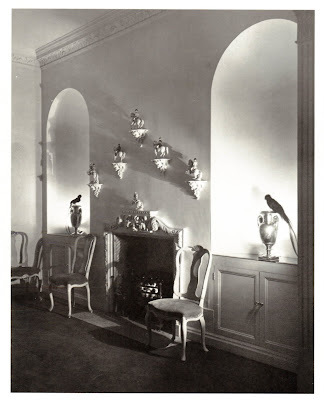 There were interiors of the Denning & Fourcade rooms in either or both House & Garden and Archetectural Digest. Mention was made of the chinoiserie wallpaper and one of D & Fs great strengths was they they were not afraid to keep what was "good" that was done by a previous designer, but the would build on it instead of thinking they had to tear everything out to make it all theirs. Somewhere I have photos of their homes by Edgar de Evia. Many of the D & F pieces are now in the Wrightsman rooms at the Metropolitan Museum of Art in NYC. Doc- Thank you for this information. I always admire the decorators who maintain the good "stuff" from previous owners/decorators.